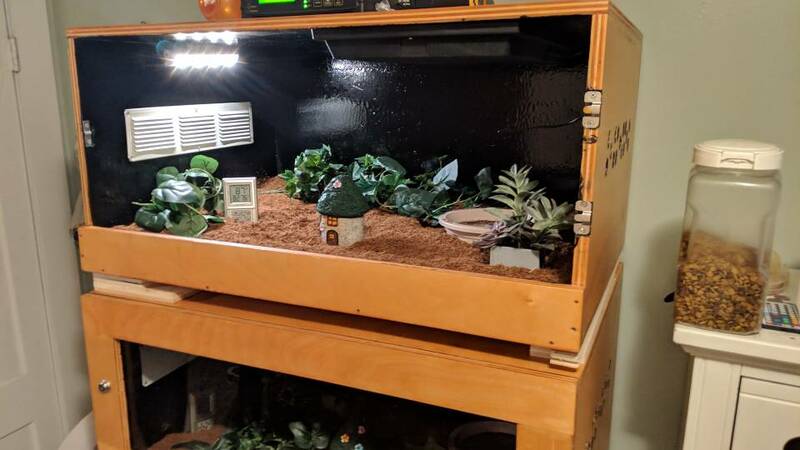 So I raised the top cage by 1.5", still only an air gap no insulation yet, and now the hottest spot I can find on the floor under the substrate is 95F (its a small area) and it has a range of 95 - 86 in the area directly above the lower RHP. On top of the substrate is between 88 - 91 on the side directly under the RHP and 78 - 81 on the cool side with the floor on this side a few degrees cooler then the substrate. Ambient air temp is hovering around 83 - 85 across the cage. All floor and substrate temps are being collected with a temp gun and ambient temps are from the Accurite thermometer/hygrometers. I've been able to maintain a humidity fluctuation between 50 and 70. I am recording how much water I add and when to be able to get it under even finer control but from my reading here this should all be fine. The floor still being over 90 in some spots I think is the only issue still to attack. I may have to break down and get some insulation to isolate it more. i wouldn't insulate the gap between the enclosures and spacer. i would rather keep the airflow. i know many peeps use hockey pucks as spacers at each corner and maybe middle/center edge. they would stack the pucks 1, 2, 3 high or whatever to get their desired airflow and temps. the cages looks great and i hope they work out for your snakes as good as they look. Do you think the floor temps are ok or should I go for more height to try to bring them down a few more degrees? I have plenty of left over plywood from the build that I can make something that will look better as spacers. right now its just scraps to see how much space I need. u would feel better if they were a tad lower but it's a small spot it seems. this is all RHP placement. u could probably swing it if no hides were place on top of it as hides are where the snakes would spend most of their time. another thing u could look at is thermostat probe placement. i haven't read this entire thread and not sure whether u placed the thermostat probe underneath the RHP, along the wall or on the floor. The thermostat probe is about 3" below the center of the RHP so basically hanging in mid air with another 11" or so till the floor. This is the recommended placement according to the RHP and the thermostat I believe. I was thinking I should move the water bowl to that hot spot. It would leave the hottest accessible spot on the floor to 92 and maybe help a little with humidity. 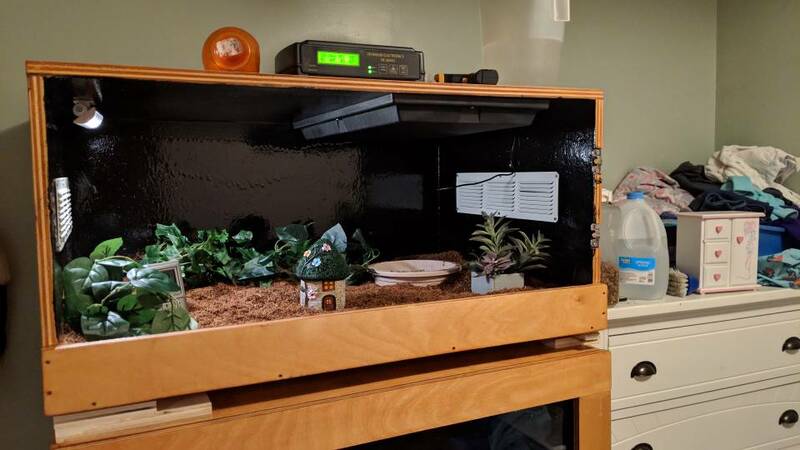 I could put the hide more in the corner where it is 89 at the floor. ah yes, let it dangle. 3inches is recommended but that's based on averages and u can make adjustments on your own temps, where u live and climate. i think putting the water bowl on the hottest spot is a good idea and would help w/ humidity w/o adding extra water to the substrate. Yeah I have an accurite thermometer/hygrometer to check ambient and humidity and I've been checking the substrate and floor temps with a temp gun as I know the thermostat is measuring the output of the RHP and not the ambient or floor so its more of a setting reading then a usable reading. Added some more clutter. Really just need the hides that will be bought when we but the snakes to get the right size.